I am posting this link and article because although Jester Chess uses concepts similar to other variants, such as the Fool or Joker, the actual game is commercially available, and furthermore, the craftsmanship on the wooden sets is outstanding. If that still doesn't convince you, the Jester piece is styled well enough to pass as any 'anon' type piece, for any other variant you may wish to use it for. I think this production is worthy of being sold to massive numbers of variant enthusiasts alike! 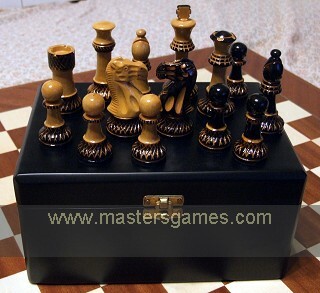 Jester Chess is a fascinating version of Chess that enhances and increases the level of complexity of the standard game of Chess in a novel fashion. Being played on a 10 x 10 square chequerboard, it is intrinsically a more complex game. But the additional Jester pieces also contribute massively to the interest:- The default version of the game is played exactly like normal chess with the addition of the Jester that moves like a Queen for its first move only and thereafter moves 1 or 2 squares along rows or columns but not diagonally. Those looking to really blow their mind might like to try another version of the game wherein the Jester moves the same way as the most recent piece played. So, if you move your Knight, your opponent will be able to move a Jester like a Knight for his next move! Click link to see all available styles or to purchase. Sets come with beautiful wooden 100 square board to measure.